South African Airways Is Now Bankrupt, What Does This Mean For Ticketed Passengers? 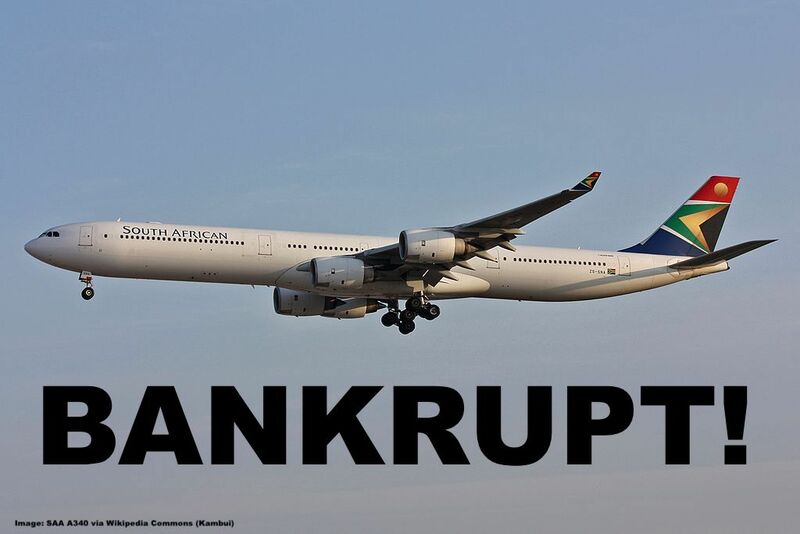 Roughly a year after South African Airways received a giant government bailout to pay back loans the airline has now technically reached the level of bankruptcy. South Africans massive liabilities now exceed the value of their assets and the company won’t even be issuing financial reports for 2017/18 which they would usually have to the Parliament. South African has received 1.8 Billion Rand (US$135 Mio) as government bailout in fall of last year (we wrote about it here) and their finances have further deteriorated since then. According to media reports the carrier has now reached the breaking point and airline executives are scrambling to see which of their assets could be sold off in order to get fresh capital. News24 (access here) wrote about the financial situation of South African and what else is going on. SAA is considering selling off assets after banks have refused to lend it any more money – and its debt ballooned to R15bn more than its assets at the end of July. A senior SAA executive told City Press this week that the airline’s finances are in tatters and the Auditor-General has raised serious concerns about its viability. SAA, which is technically bankrupt, will therefore not present its 2017/18 financials to Parliament by the end of this month, as required by law. Senior SAA staff and a confidential report, presented at the company’s board strategy session 10 days ago, reveal that the airline’s management is now looking at a number of aggressive cost-cutting measures, including selling off its catering arm, Air Chefs, and outsourcing or selling SAA Cargo. A top official at the national carrier told City Press that in the meantime, the company would look to government for more bailouts because banks have “hardened their attitudes” and are “continuing to refuse” to lend it more money, despite Treasury guarantees. Cargo is usually a profitable entity for any airline and catering is needed to operate any of their passenger flights so selling off these arms of the company would essentially require SAA to pay the new owners of their catering firm and at the same time lose the earnings of SAA Cargo. The cash they’d receive for these two entities would be gone pretty quickly if not immediately and they’d have to pay bills from day one of this transaction being completed. – SAA needs to reduce costs by 5.2% and increase revenue by the same amount to record a R1bn improvement by the end of the current financial year. Although the report did not mention anyone by name, it slated the previous board, led by former chairperson Dudu Myeni, for leaving SAA with rampant corruption, low pilot productivity, a significantly weak balance sheet, liquidity problems, loss of confidence from suppliers, a lack of critical skills and fragmented IT systems. “Unfortunately, SAA has had acting people in most senior positions. The board was also fractured and there was a lot of instability. The problem here is not even the market, but within, with people stealing and committing fraud,” another executive said. As I mentioned in the previous article, this level of corruption is just one example of of an airline that has run deep into the red due to funny business by appointed executives with political connections. They go on and on while running heavy losses. Air India, Malaysia Airlines, Thai Airways, South African and of course the list continues to grow. What does this situation mean for the customers, especially those who already hold tickets on SAA? I don’t expect South African Airways to go anywhere or cease operations anytime soon. SAA is the only flag carrier South Africa has and therefore vital to the countries infrastructure. In situations like these the government usually continues to provide financial aid to keep the airline flying at the eleventh hour or in the form of ongoing restructuring plans. Just look at Alitalia which is a flying disaster for decades yet it’s still in the air. There is also something that I like to call the “crony insurance” namely that the government fat cats of a country that relies on this one carrier don’t want to lose their travel and pampering privileges. A lot of people in a country such as South Africa (same as Thailand, Malaysia etc) are getting preferential treatment from the airline which they don’t want to lose. That’s reason enough for them to keep the money faucet open. As a ticketed passenger I wouldn’t be nervous about the validity of my ticket. Just keep in mind to always pay by credit card for your tickets to be able to get a refund from the credit card company in the worst case scenario. Do not pay cash at a travel agency or ticket counter. Credit Card only! I don’t expect any banks to jump in at this point. The airline has no assets available, runs deep in the red and has no viable restructuring plan to demonstrate how to get out of their misery. This comes on top of South Africa’s current political problems, especially in the domestic area. Not a great territory for a bank to get involved in. I bet Citibank was glad they got their money back due to the government bailout last year.